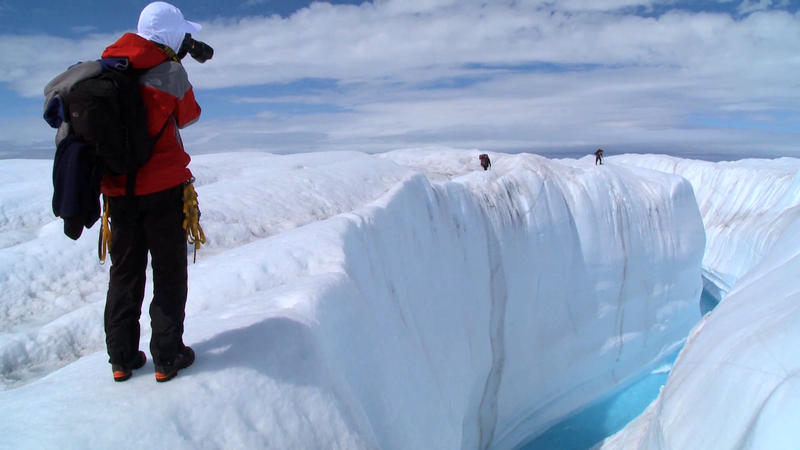 Distributed as part of the collaboration between The Co-operative and Dogwoof that has previously given us Burma VJ and Gasland, Chasing Ice continues the aims of the partners in pushing documentaries covering socially relevant issues towards the mainstream. After Gasland, it is perhaps little surprise to find that they have again opted for a well-produced Indie documentary, focusing on man's negative effect on the environment. Chasing Ice has two subjects; the titular frozen water and the long-term implications of its demise on our climate and James Balog, a National Geographic photographer and the type of adventurer/explorer/daredevil who thinks nothing of dangling over a crevasse or two with a ropey bit of, well... rope, to secure him to terra firma. The focus isn't really 'split' between the two but they are certainly different subjects and although their stories are unified, their concerns are separate. The retreating of the ice flows has global implications (there is some of the same ground here covered by the BBC's excellent Frozen Planet) but on a personal level, Balog's risk-taking and establishment of a new studying organisation competes with his body's vulnerabilities, as he is forced away from the ice face and behind powerpoint presentations and TED talks. That's a lot of ground, a lot of issues, conflicts and ideas, for a seventy-six minute documentary to cover and at times it struggles. We see glimpses of Balog's journey but they're tantalising. One shot of him falling from a husky sled, one shot of a truck stuck in a river; each could have been ten-minute segments in a longer film. Even just extending the runtime to ninety minutes, you get the impression Chasing Ice may have been more satisfying. What is here though is frequently as shocking and awe-inspiring as you might expect from this subject area. Covering a photographer, director Jeff Orlowski seems keen to respect the sanctity of the still image and his film reflects that. Equally, this is a motion picture and the inclusion towards the end of a huge break-off of an iceberg - really unimaginably large - is as horrifying as it is spectacular. There is great stuff here. I just wish there was even more of it. Chasing Ice is released in UK cinemas on Friday 14th December 2012.